Little Rock's Pallbearer add some studio sheen with their sophomore release while maintaining the mudslide-like heaviness of their acclaimed debut. Due to its dynamics, metal bands are generally divided into two categories: those that hit you like a jackhammer, and those that hit like a steam roller. Little Rock, Arkansas' Pallbearer snugly fit into the latter category. Their heralded debut album Sorrow and Extinction was the 45-minute aural equivalent of a slow-moving lava flow. Pallbearer has proven to a be a band that requires a patient ear. Case in point, with their latest album, Foundations of Burden, their total output of songs now finally cracks the double-digit mark at 11 (not counting "Gloomy Sunday" off their 2010 demo). Their live shows can only be described as crushing, courtesy of Devin Holt's guitar assault. Foundations of Burden has the unenviable task of being the sophomore release of a tremendously well-received debut. Novice listeners are pretty much thrown into the deep end with the ten-minute opening track "Worlds Apart". Without a catchy riff or much in terms of show-off musical theatrics, "Worlds Apart" carefully unfurls itself. It's a logical extension Sorrow's lengthy jams, but with a noticeably clearer production. The crisper sound is partly credited to producer Billy Anderson, whose studio work has included Mr. Bungle, Swans, High on Fire, Impaled, and Sleep's stoner classic Dopesmoker. While the sounds of both bands are vastly different, it's hard not to draw comparisons to Austin's ...And You Will Know Us By the Trail of Dead just because of the song title "Worlds Apart". That band's 2005 album (also titled Worlds Apart) also had to difficult task of being the follow-up to an album that critics considered to be a minor classic. And like ...Trail of Dead, Pallbearer's new studio sheen promises to lure in even more listeners at the risk of alienating a minority of original fans who were attracted to the low-fi fuzz of their previous album. For all of Foundations of Burden's epicness, the three-minute "Ashes" stands out as a beautiful calm cleanser before the powerful, crescendoing closer "Vanished". Its soft melody almost veers into '70s stalwart Kansas territory. 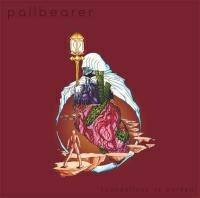 With its track length and prettiness, it could even pass as a radio single despite the marked contrast Pallbearer's lumbering epics. If there are any faults on Foundations of Burden, it's that the middle portion of the album tends to succumb to a sameness sound, which is almost inevitable when you have two 10-minute plus tracks back to back. Fortunately, the demand for subsequent listens is hardly a laborious task, given Brett Campbell's stellar, sustained vocal delivery. Credit also needs to be given to bassist Joseph Rowland and drummer Mark Lierly for creating much of Burden's dark atmosphere. In a genre that routinely extols the virtues of speed, Lierly's careful, methodical drumming is a perfect example of the "less is more" approach for rhythm. Foundations of Burden deviates just enough from Sorrow and Extension to give Pallbearer a wide array of venues to explore for their next album. As a sophomore album, it does everything it needs to do to keep Pallbearer's status as being elites in their genre. "Then souls set free amidst the gray / Lifted through the ashes," Campbell sings on "Ashes." With Foundations of Burden, Pallbearer escape the suffocating expectations of a high-pressure follow-up with their unrestrained power intact.